Ubon Ratchathani is one of the northeastern provinces of Thailand, and the country's easternmost. Ubon is about 630 km (390 mi) from Bangkok. Neighboring Provinces are Sisaket, Yasothon, and Amnat Charoen. To the north and east it borders Salavan and Champasak of Laos, to the south Preah Vihear of Cambodia. 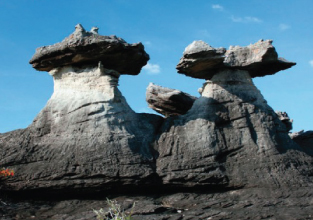 Ubon Ratchathani has been a well established community for hundreds of years. Relatively unknown to the most tourists, the province boasts a number of natural wonders, cultural and historical attractions, national parks, silk producing shops, etc. 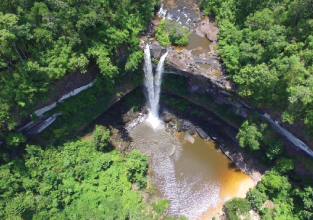 This waterfall is located in Phu Chong Na Yoi National Park, which covers an area of about 686 square kilometres, or 428,750 rai. The waterfall is quite large, falling nearly 40 metres from a pond on a cliff. The waterfall is divided into three levels, with the lower level being the most interesting. Trails exist along the waterfall for visitors who want to climb to the top. The pools created by the waterfall are ideal for swimming. In the northeast of Thailand, there is another beautiful unseen natural wonder called, Sam Phan Bok, or Grand Canyon of Thailand. 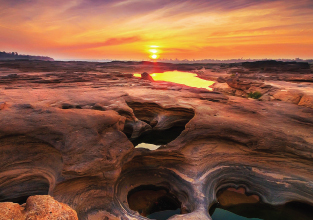 Located in Pho Sai district, Ubon Ratchathani, Sam Phan Bok is a new destination that attracts numerous people to watch memorable sunsets and to spend the night on the fascinating rocky ground. 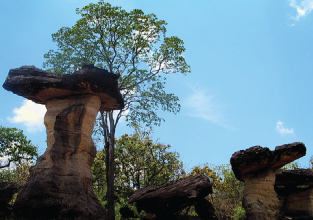 Chanadai Cliff is located in the north part of Pha Taem National Park. The main entrance to the park in the south where most tourists go is about 200 meters above sea level. Chanadai is 430 meters in comparison and offers a significantly more spectacular view. It’s also significantly more difficult to access. It took us 2 hours to go 13.3km. The first half is very rocky with plenty of pot holes and tight turns but it’s very accessible in a truck or SUV.